What exactly is the difference between interpreting and translating? Translators transfer written content from the source into the target language (which should always be their first language). Interpreters transfer spoken content from the source into the target language – in real time, as it were. While translators have a certain amount of time to reflect and research when they transfer their written content, interpreters are required to transfer the spoken word in the shortest possible time verbally into the other language – off the cuff, as it were. The different types of interpreting. This form of interpreting is used at international conferences, trade fairs, meetings or events. Positioned in soundproof booths, interpreters use headphones to listen to the presentations of the various speakers and – keeping the time lag to a minimum – interpret them from the foreign language into their first language without losing the thread or omitting a single detail, correctly in content and style, and with enormous constraints in terms of time, too. 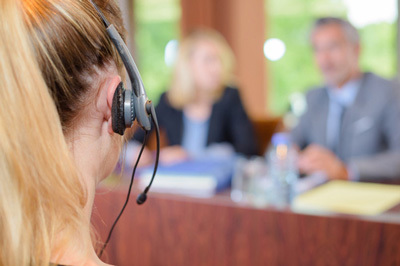 Simultaneous interpreting is often referred to as the supreme discipline of language services, requiring not only excellent linguistic skills, expertise, concentration and comprehension, but also exceptional cognitive flexibility and creativity. Since a brief pause for thought is necessary after 20 minutes before the interpreter’s brain has to operate at full capacity again with maximum precision, interpreters usually work in the interpreting booth in pairs and replace each other at 20-minute intervals. Our simultaneous interpreters have mastered their art perfectly, have many years of experience and deserve our highest respect. We entrust the organisation of the interpreting booths, microphones, headphones and the associated technology to one of our long-standing partners. eurolanguage’s specialist translation service provides you with a comprehensive package for your event, meaning you need not worry about anything else. Since our language experts operate in every corner of the globe and we would like to reserve the right interpreter for you, please remember to speak and plan your interpreting assignments with us in good time. Consecutive interpreting is recommended for smaller discussion rounds, conferences, meetings or business lunches with your international business partners. Unlike simultaneous interpreting, technical equipment is not required but rather ONLY an extremely competent consecutive interpreter. What exactly does ONLY mean in this context? Apart from the technology, which is not required for consecutive interpreting, the requirements are extremely demanding here, too. 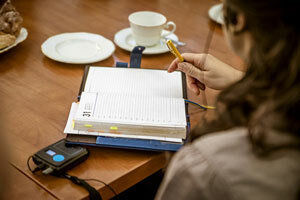 This form of interpreting involves a time lag – in contrast to simultaneous interpreting. The interpreter listens to the speaker’s presentation, takes written notes, and then relays what she/he has heard in the desired target language of the foreign-speaking audience after a brief pause. The speaker makes appropriate pauses to allow the interpreter to transfer what has been said section by section. The speaker and the interpreter alternate at coherent points in the presentation, enabling the conversation to flow naturally and a pleasant atmosphere to develop for all participants. Co-operation is important in consecutive interpreting – the speaker and the interpreter becomea team of sorts, in a foreign-language dialogue. In linguistic unison (or more to the point harmony), positive and successful conversations develop between you and your business partners. At the same time, just like simultaneous interpreting but without the technical aids such as an interpreter’s booth, microphone or headphones, whispered interpreting takes place in the background. This form of interpreting is recommended for sightseeing and guided tours or events with many participants in different languages, for example. The interpreter is very close to you and whispers the translation into your ear. This has certain advantages, of course: The mobility in different premises and costs are lower because the outlay for technology is not necessary. The disadvantages are that only a maximum of two to three listeners can be attended to and the local conditions must also allow whispered interpreting without acoustic problems. For example, when background noises are too loud or there are too many people in a public area, whispered interpreting would be more of a disturbance and unintelligible for participants. Consider the following scenario: A business meeting, all foreign-language participants are informed about subject matter and business plans. You then assemble to clarify further minutiae and work through the details. It is at this point that you should have a competent liaison interpreter at your side, as she/he ensures that all subtleties and nuances are conveyed to the people you are communicating with exactly and accurately in terms of content. 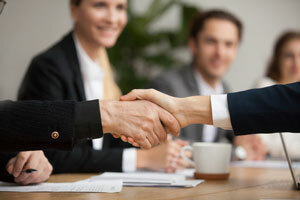 When it comes to interacting expediently with foreign business partners, this form of linguistic mediation is an indispensable tool for multinational companies. Linguistic and expert dialogue is an important component of your international success. eurolanguage, especially Martina Schmid, advises you with no strings attached, i.e. at no cost to you, on which form of interpreting is best for your special occasion, your event, your meeting, your trade fair, your corporate training, etc. Our interpreting services are charged at half-day or full-day rates. Thanks to our Europe-wide network of partners, we can provide you with language professionals at many locations directly in your country. This applies especially to Germany, Austria, Switzerland, France and Italy. Having said that, you can also count on our professional language services in the countries immediately adjacent to us. In the case of events, congresses or trade fairs lasting several days, it may be necessary to add overnight accommodation and dining expenses to the daily rates. Call us, we will be delighted to help! DO YOU NEED PROFESSIONAL INTERPRETING ASSISTANCE FOR YOUR EVENT, YOUR MEETING OR YOUR CORPORATE TRAINING? Give us the basic information and we will look after everything else. The interpreters of eurolanguage take care of reliable and calm dialogue for your international communication.